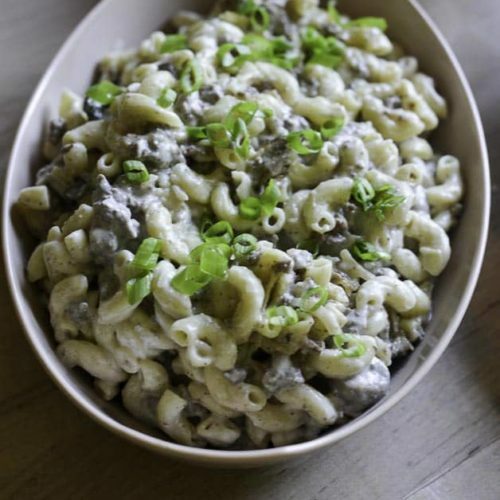 You don’t need to buy a box of Hamburger helper for something this easy, and the taste is so much better! It’s quick and easy. You can eliminate many preservatives when you prepare recipes from scratch. I suggest that you can go up to 2 pounds of ground beef if you really want a heartier dinner. You may also want to add a couple of small cans of mushrooms to this recipe. You may also want to switch the soup recipe for the Mushroom Soup with Roasted Garlic variety. It would work well too! Don’t be afraid to swap out the pasta for noodles that you have on hand! I often use a recipe like this to use up the odd bits of pasta that I have left over. Looking for more easy skillet dinners? 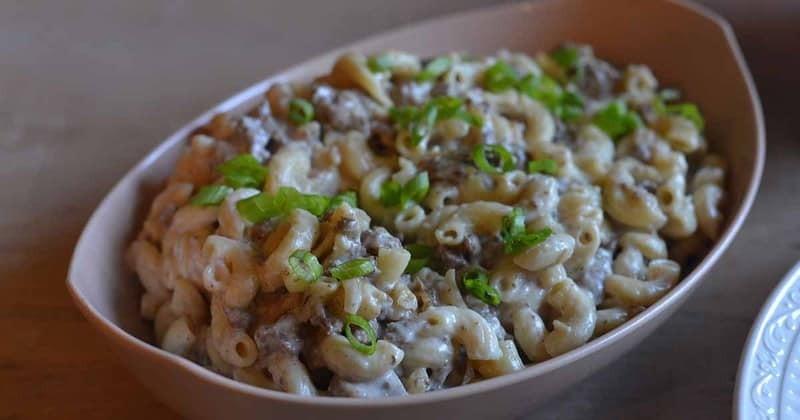 You can make a flavorful stovetop casserole like Hamburger Helper. Brown the ground beef and then drain off fat in a large skillet that has a lid. Add the onion soup mix and water and mushroom soup mix (if you want). Mix well and bring to a boil. Add the Bow Tie pasta and bring back to a boil. Reduce the heat to medium-high and cover. Cook for 10-12 minutes. Take off heat and gently stir in the sour cream. Enjoy this quick and delicious version and you won’t go back to the box. If you would like to make more of a meal out of this, add some fresh broccoli or other vegetables. If you want a cheesy dish to use a cheese instead of the sour cream. Throw in some diced tomatoes and really enjoy something nice! Thanks to Maclll for sharing this recipe. Thanks to Maclll for sharing this recipe. 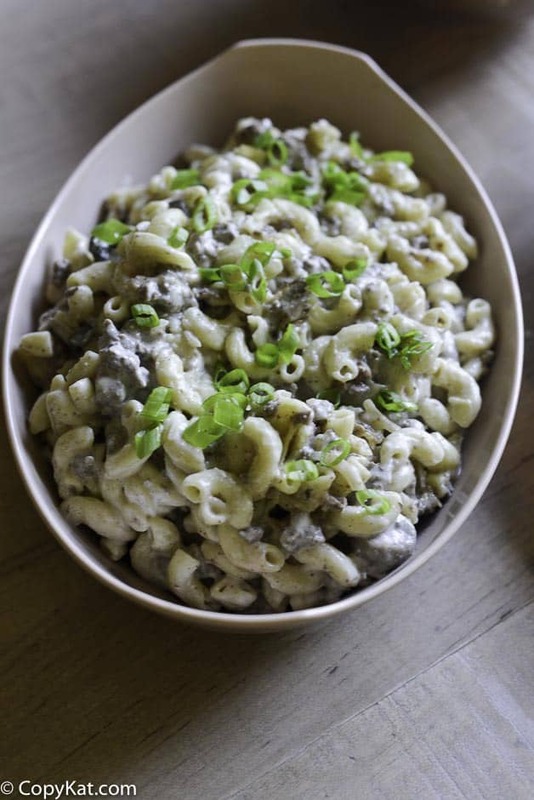 I made this tonight and tried to make it healthier with using lean ground chicken, fiber rich pasta, low fat mushroom soup, and reduced fat sour cream. With one packet of the beefy onion soup mix it seemed very bland to me, so I added the second pouch of seasoning mix then noticed between the two packets it totaled 600% of your daily value of salt. To me, this outweighs the benefits of making it yourself with healthier ingredients. It was good but I’m not sure if I’ll make it again. I will probably make my own seasoning mix next time and use low sodium beef broth. Good recipe though in general. My husband really loved it. Try adding half water and half apple juice. It will make the recipe an even greater hit. You can easily and cheaply replace the cream of (whatever) soups in most recipes by making a white sauce instead. This allows you to control the fat & sodium as well as adjusting for dairy issues. The ratio is 1 T butter to 1 T flour to 1 cup milk. Double the amounts if you are replacing a whole can of soup. Melt the butter in a skillet over med-low heat and stir in flour until combined. Add the milk and stir constantly with a whisk to remove lumps. Keep stirring intermittently until the sauce thickens. Add salt & pepper to taste. Set aside and add to your casserole in place of your cream soup. If you miss the mushrooms, you can saute some in a little more butter and add it to the sauce. You can also add things like garlic powder & onion powder if you like them. i didnt really care for this recipe. it took quite a while for the pasta to cook and it seemed like if there was more liquid, it probably would have cooked faster. and the taste was just ok. i taste like it WAS out of a box. I made this for dinner last night. I was surprised. It was awesome, so tasty! My family loved it! I’d like to see a recipe for how to make Jimmy Dean Sausage at home.